Jazz is returning to Lanyon Homestead for a summer season: Friday evenings, 3 Feb - 10 Mar, 5.30-8.30pm. Gold coin donation. The series features several bands out of the CSM, starting on 3 Feb with Eric Ajaye's excellent trio called Straight Up! See my review of an earlier concert at Lanyon below. Friday 3 February STRAIGHT UP! Eric Ajaye, lecturer in Jazz Studies at the Canberra School of Music, joins with drummer Chris Thwaites and pianist Michael Azzopardi to play modern jazz originals. Friday 10 February 5.30pm-8.30pm FIRE ON THE HILL. Jazz guitarist Lachlan Coventry, joins with bass, drums and slide to play his original material. Friday 17 February, 5.30pm-8.30pm MALONE. Singer/songwriter Gareth Malone plays original soul, R & B and contemporary jazz material with Charlie Meadows and Nick Hoorweg. Friday 24 February, 5.30pm-8.30pm SWING GUITAR. Three prominent guitarists and double bass players come together to perform the swinging Gypsy Jazz of Django Reinhardt and the ‘The Quintet du Hot Club de France’. 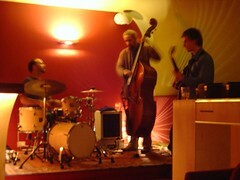 Thanks to Pete Lawley for this pic from the Trinity Bar Tuesday evening sessions. Found on Flickr. I must put in a rave about the band, Zip. Zip are Linda Tinney (piano/vocals), Graeme Tinney (bass), and Amanda Waite (drums). They all have backgrounds at the School of Music. They play a careful, considered, soulful, gospel influenced, R&B repertoire. And they do it with love and precision. Great music. Here's a pic from a performance at Red Gecko on Sunday afternoon. Recommended. Sadly, I hear we are about to lose them from the Canberra music scene. This is not strictly Canberra Jazz, but I have a few (poor) pics, so I’ll include them here. I visited Vietnam and Hong Kong for a short trip last year (Sept-Oct 2005). There’s a lot of interest amongst Australian jazz musicians about performing in Asia, and I’ve heard about several Australians travelling there to perform, or who are based there. I saw a wonderful concert a few years ago with Blaine Whittaker. He’s a supremely competent Australian alto bop player who, at least at the time, was resident in HK. He came over with the HK-based, US-originated, pianist Allen Youngblood and performed a little big-band set with the cream of Sydney players (Dale Barlow et al) for SIMA at the Side-On Cafe. On my trip, I got to visit 2 jazz clubs. The first was [Quyen Van] Minh’s Jazz Bar, centrally located in Can Luong van Can in Hanoi (see “Jazz Club” on this map). Apparently, Minh is a sax player and teacher in Hanoi. I didn’t even know who I was seeing that night, but I presume Minh was the tenor player and leader. He was accompanied by electric bass, electric piano, sometimes trumpet or alto, and several drummers, who once changed over while performing one tune. The music was mainstream and standards. The playing was competent, entertaining and sometimes frantic, rather than particularly inventive. It’s a big club, with a prominent neon sign out front, so you can’t miss it. Free entry; beer on tap. The second visit was to Hong Kong’s Fringe Club for jazz. The Fringe Club is interestingly located next to the famous HK Foreign Correspondents Club. It’s an intimate venue. Originally the Richard Malmstein (Swedish bassist; now local) quartet was to play, but RM was not available. He was replaced by a local bassist who is obviously a local hero: Tsang Tak Hong. TTH played fusion on a 5 string (Schecter?) bass. He was a wonderful player, easily of international standard. Strong on setting and maintaining the groove; lots of fast solos flayed across the fingerboard. He didn’t venture from fusion, but he did that fabulously well. The other players were Miles Li (alto sax from US, originally from Korea), Per-Axel Johnson (guitar, friend of Rich Malmstein, and visiting HK) and Robin Harris (Drums, US). P-A J was a much sweeter player, and obviously out of place in this fusion outfit. I spoke to P-A J and, interestingly, at one stage, he volunteered that Australia produces very good jazz players. Australia obvious has a reputation. Cover charge; grog available. There were other jazz events around HK, but I only got to this one. But in parting, here’s a pic from Tom Lee’s Music Store just off Nathan Street in Kowloon. It’s big store, and relaxed. Lots of basses to pick up and try out, and no-one hanging over your shoulder. They also seem to have plenty of visiting master classes. Nathan East was to give a class just a few days after I left.